Electronic artist, develops interactive installations that are at the intersection of architecture and performance art. His main interest is in creating platforms for public participation, by perverting technologies such as robotics, computerized surveillance or telematic networks. Inspired by phantasmagoria, carnival and animatronics, his light and shadow works are "antimonuments for alien agency". He has received two BAFTA British Academy Awards for Interactive Art in London, a Golden Nica at the Prix Ars Electronica in Austria, "Artist of the year" Rave Award from Wired Magazine, a Rockefeller fellowship, the Trophée des Lumières in Lyon and an International Bauhaus Award in Dessau. He has lectured at Goldsmiths college, the Bartlett school, Princeton, Harvard, UC Berkeley, Cooper Union, USC, MIT MediaLab, Guggenheim Museum, LA MOCA, Netherlands Architecture Institute, Cornell, UPenn, SCAD, Danish Architecture Cente, CCA in Montreal, ICA in London and the Art Institute of Chicago. "Voice Array" is a construction for vocal improvisation that uses blinking LEDs and a customized intercom system of audio playback and recording. Capturing hundreds of voices and translating each one into a series of light flashes, the piece stores a unique pattern as a loop in the first light of the array, until the next participant speaks into the intercom. Each new recording is pushed along its long horizontal band of LEDs, as sounds of the voices gradually accumulate. When the first voice reaches the other side of the piece, the participant’s phrase is once again released as sound, punctuated by the staggering pulsation of all the lights in tandem. The ever-changing voices stored by the piece play back through a directional speaker, during moments of less activity. Rows of motorised measuring tapes record the amount of time that visitors stay in the installation. As a computerised tracking system detects the presence of a person, the closest measuring tape starts to project upwards. When the tape reaches around 3m high it crashes and recoils back. Each hour, the system prints the total number of minutes spent by the sum of all visitors. Commissioned by the Museum of Contemporary Art, Sydney. "Semioptics for Spinoza" is the third installation from Rafael Lozano-Hemmer’s "Shadow Object" series of works, which feature objects with animated, alien shadows. A plano-convex lens, similar to those made by philosopher Baruch Spinoza for Huygens' telescopes, is suspended from a thread and moves with the air flow and with a small motor. Projected on the wall behind the lens is a set of artificial lens flares generated by equations that take into account the orientation of the lens in relation to the viewing public. The project generates fake light beams that go through the real lens: the lens then diffracts and scatters the fake light creating light source aberrations, directional haze and chromatic distortion. The piece is a mobile that can be moved when touched lightly or by blowing upon it to change the corresponding lens flares. Installation view at NOMA Museum, Prospect.1, New Orleans Bienniale, New Orleans, LA. "Pulse Tank" records the heartbeats of viewers. Their pulses reverberate through the water as ripples, radiating outwards from the source and illuminated on the surrounding walls. The vital signs of up to 5 people can be simultaneously detected, creating turbulent patterns in the water. "Reference Flow" is an interactive installation where a number of illuminated EXIT signs, supported by motorized stanchions, rotate automatically as people walk past them so that they always signal escape routes to the left. If several people stroll through the signs they get disoriented as they try their best to confront each person with his or her left. A large motorized Mexican “cantina” table with 30 “Caguama”-sized beer bottles (1-liter each). The bottles spin on the table with patterns generated by cellular automata algorithms that simulate the neuronal connections in the brain. Every few minutes the bottles are reset and seeded with new initial conditions for the algorithm so that the movement patterns are never repeated. This kinetic sculpture is a primitive and absurd attempt to materialize the mathematics of recollection and thought. Installation view at La Gaîté Lyrique, Paris, France, 2011. "Surface Tension" is an interactive installation where an image of a giant human eye follows the observer with orwellian precision.This work was inspired by a reading of Georges Bataille's text The Solar Anusduring the first Gulf War: first wide-spread deployment of camera-guided "intelligent bombs". Present-day computerised surveillance techniques employed by the Department of Homeland Security in the United States through the Patriot Act, provide a new and distressing backdrop for this piece. The installation was originally developed in 1992 at the Universidad Complutense de Madrid as a stage module for a theatre work by the Transition State Theory troupe. Since then, Surface Tension has been presented as an art installation, typically on a plasma screen. "Please Empty your Pockets" is an installation that consists of a conveyor belt with a computerized scanner that records and accumulates everything that passes under it. The public may place any small item on the conveyor belt, for example keys, ID, wallets, worry beads, condoms, notepads, phones, coins, voodoo dolls, credit cards, etc. Once they pass under the scanner, the objects reappear on the other side of the conveyor belt beside projected objects from the memory of the installation. As a real item is removed from the conveyor belt, it leaves behind a projected image of itself, which is then used to accompany future objects. The piece remembers up to 600,000 objects which are displayed beside new ones that are added to the installation. "Bifurcation" is the second installation from Rafael Lozano-Hemmer’s "Shadow Object" series of works, which feature objects with animated, alien shadows. "Bifurcation" is a small Y-shaped branch, similar to a dowsing rod, which is suspended from a transparent thread and moves with the wind and a small motor. Projected on the wall behind the branch is its shadow - only you can see the entire tree from where the branch came. As the branch rotates so does the shadow of the tree, creating the illusion of completion. Installation view at The Eleventh Bienal de la Habana, Havana, Cuba, 2012. "Last Breath" is a robotic installation that stores and circulates the breath of a person forever, between a bellows and a brown paper bag. The apparatus is automatically activated 10,000 times per day, the typical respiratory frequency for an adult at rest. With each breath the piece generates quiet sounds from the bellows, the motor and the crackling of the paper bag. The piece also sighs 158 times a day. For the exhibition in New York, the piece is a biometric portrait of Cuban singer Omara Portuondo. A short video of her recording her breath into the device is shown on a small screen mounted to the wall. When people look at themselves in this small mirror they see the word Autopoiesis projected on their forehead. The term ‘Autopoiesis’ was coined by Chilean biologists Humberto Maturana and Francisco Varela. Literally meaning self-production or creation, it refers to the way in which living beings are seen as systems that produce themselves, or regenerate, in a ceaseless way. An autopoietic system is at the same time the producer and the product. The concept of self-creation is an inspiration for all art that depends on participation to exist. Installation view at East Midlands Development Agency, Brayford University Campus, Lincoln, UK. "Under Scan" is a public art installation based on self-representation, commissioned by East Midlands Development Agency, UK. 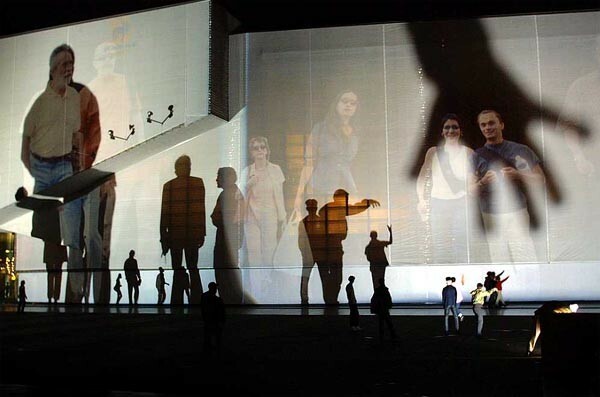 Thousands of “video portraits” taken in Derby, Leicester, Lincoln, Northampton and Nottingham were projected on to the ground; at first, the portraits are not visible because the space is flooded by white light coming from a high-powered projector. As people walk around the area, their shadows are cast on the ground, revealing the video-portraits in short sequences. These sequences begin with the subjects in a still position, turned away from the camera. As they appear within the cast shadows, their bodies move and their heads turn to look straight at the pedestrian, establishing eye contact. When a person’s shadow moves away from the portrait, the portrait reacts by turning away and becoming dormant, eventually disappearing altogether. Installation view at Art Basel 35 with Galería OMR, Basel, Switzerland. "Standards and Double Standards" is an interactive installation that consists of fifty fastened belts that are suspended at waist height from stepper motors on the ceiling of the exhibition room. Controlled by a computerized tracking system, the belts rotate automatically to follow the public, turning their buckles slowly to face passers-by. When several people are in the room their presence affects the entire group of belts, creating chaotic patterns of interference. Non-linear behaviors emerge such as turbulence, eddies and relatively quiet regions. One of the aims of this piece is to visualize complex dynamics, turning a condition of pure surveillance into an unpredictable connective system. The piece creates an "absent crowd" using a fetish of paternal authority: the belt. Installation view at Mexican Pavilion, 52 Biennale di Venezia, Venice, Italy. "Wavefunction" is a kinetic sculpture comprised of fifty Charles and Ray Eames moulded chairs (designed in 1948) and placed in ten rows of five chairs each, facing the entrance to the exhibition space. When someone approaches the work, a computerized surveillance system detects their presence and the closest chairs automatically begin to lift off the ground, creating the crest of a wave that then spreads over the whole room. A system of electromechanical pistons raises each chair forty centimetres from the ground. The pistons are controlled by a computer that runs the mathematics of fluid dynamics, thus making the waves interfere with each other, creating turbulence or becoming calm, just like real water. Periodically, the chairs stop interacting with the public and perform a choreography set to the music of Claudio Monteverdi’s Lamento d’Arianna. The idea of a “function” as a field for artistic experimentation is a motivation for this piece. Other references include: the mathematics of dynamic systems, capable of generating complex non-linear behaviors, the materialization of surveillance and turbulence and the anti-modular reinterpretation of the work of modern designers such as Charles and Ray Eames. Installation view at Yamaguchi Center for Art and Media, Yamaguchi, Japan. Rafael Lozano-Hemmer’s public installation, "Amodal Suspension", was created to commemorate the opening of Japan’s Yamaguchi Center for Arts and Media in 2003. Designed as a large-scale interactive installation, the public could use the website amodal.net to send short text messages to each other using a cell phone or web browser, however, rather than being sent directly, the messages were encoded as unique sequences of flashes with 20 robotically-controlled searchlights, turning the sky around Yamaguchi into a giant communication switchboard. Inspired in part by the Tanabata tradition of hanging wishes on bamboo, the project received over 400,000 unique visitors from 94 countries. Installation view at bitforms gallery nyc. "Third Person" is the second piece of the ShadowBox series of interactive displays with a built-in computerized tracking system. This piece shows the viewer's shadow revealing hundreds of tiny words that are in fact all the verbs of the dictionary conjugated in the third person. The portrait of the viewer is drawn in real time by active words, which appear automatically to fill his or her silhouette. The collector may choose to display the words in English, Spanish or French, or a combination of the three languages. The piece exists in a shadow box format and as a large installation with projectors. Installation view at Printemps de Septembre Festival, Place du Capitole, Toulouse, France. In this intervention the emblematic Place du Capitole in Toulouse was transformed by a projection of The Book of Two Origins, a 13th-century heretical manuscript compiling the theological beliefs of the dualist cathars. Once a vibrant community in several regions of Europe, the believers in the two origins of the Universe were virtually annihilated by the brutal crusades that gave birth to the Inquisition and France’s expansion. The texts are illegible since they are projected overlapping each other on the same façade from two distant projectors; only when passers-by block one text with their bodies is it possible to read the other text inside their shadow. "Two Origins" attempts to connect disparate planes of experience, inviting people to discover texts that have been covered-up by history and intolerance. References for this work include research into the “minor histories” that characterize European trends of pluralism and dissent. Installation view at Sala de Arte Público Siqueiros, Mexico City, México. "Subtitled Public" consists of an empty exhibition space where visitors are tracked with a computerized infrared surveillance system. As people enter the installation, texts are projected onto their bodies: these “subtitles” consist of thousands of verbs conjugated in third person and they follow each individual everywhere they go. The only way to get rid of a subtitle is to touch someone else: the words then are exchanged between them. The piece invades the supposed neutrality of the space that museums and galleries set-up for contemplation, underlining the violent and asymmetric character of observation. "Subtitled Public" also highlights the danger of surveillance systems that typecast and try to detect different ethnic groups or suspicious individuals, as in the latest computer-vision devices that are being deployed in public spaces around the world. Finally, the installation is an ironic commentary on our era of technological personalization, literally branding all spectators and converting them into “thematic individuals”. "Blow-up" is a high resolution interactive display that is designed to fragment a surveillance camera view into 2400 virtual cameras that zoom into the exhibition space in fluid and autonomous motion. Inspired by Antonioni, the piece is intended as an exercise to underline the construction of presence through a simulated, live compound eye. Installation view at V2_, Rotterdam, The Netherlands. Thousands of portraits, taken on the streets of the cities where the project is shown, are projected on a giant screen or façade using elevated robotically-controlled projectors. However, the portraits are completely washed out by powerful xenon light sources placed at ground level. When people cross the square their shadows appear on the screen and the portraits are revealed within them. The shadows and portraits generate a play of reverse puppetry and embodied representation. Silhouettes measure between 2 and 30 metres high, depending on how far participants are from the screen. A camera-based tracking system monitors the location of the shadows in real time. The computer vision interface, which is shown and explained on the site, triggers quiet feedback sounds when a shadow and a portrait match in scale. When the shadows have revealed all the portraits in a given scene, an automatic command is issued to change the scene to the next set of portraits. This way the people on the square are invited to match different representational narratives. Over 60 people may take part at any given time, creating a collective experience that nonetheless allows discrete individual participation. "Body Movies" is the sixth in the series of “relational architecture” installations that Rafael Lozano-Hemmer has designed for cities in Europe and America for the past ten years. These interactive interventions have been exploring the intersection between new technologies, public space and performance art. The piece attempts to create an anti-monument of alien presence and embodied relationships. "Alpha Blend" is the seventh piece in the Shadow Box series of interactive displays with a built-in computerized tracking system. This piece shows the viewer's presence revealing pictures of people who have recently looked at the work. A game of "reverse puppetry" ensues, where a portrait from the past is animated by a live presence, in a similar perceptual mechanism to the one used in Lozano-Hemmer's public art installation Body Movies. In "Less Than Three," a baroque network of light tubes suggests the convolutions of communication. As a participant speaks into a nearby intercom, their voice is translated into corresponding flashes of light and this light pattern is transmitted visually along one of the several possible pathways through the network. When it reaches the other side, the viewer's phrase is once again released as sound. Aerial view of Madison Square Park, New York City. "Pulse Park" is comprised of a matrix of light beams that graze the central oval field of Madison Square Park. Its intensity is entirely modulated by two sensors that measure the heart rate of participants and the resulting effect is the visualization of vital signs, arguably our most symbolic biometric, in an urban scale. Installation view at Center for Contemporary Culture - Melnikov Garash, Moscow, Russia. The layout of lightbulbs for "Pulse Spiral" is based on the Phyllotaxis Spirals that are naturally derived from Fermat’s equation r=±ø^1/2. This pattern creates a spiral with the golden angle of 137.5º, which is often found in nature, for instance in sunowers. It turns out this pattern produces the most even--and beautiful-- three dimensional distribution of lightbulbs, forming a spiral paraboloid. "Pulse Spiral" records and responds to the heart rate of participants who hold a sensor underneath. Originally commissioned for the opening of the Center for Contemporary Culture in Moscow in the constructivist Bakhmetevsky Bus Garage, the piece was inspired by engineer Vladimir Shukov who worked with Melnikov on this emblematic building from 1926-28. Persian (1058-1111), author of "The Incoherence of Philosophers"
The series "Seismoscopes" consists of devices that detect vibration around them, from footsteps to earthquakes, and record this vibration on paper using an automated XY-plotter. As each Seismoscope registers any seismic wave it is programmed to draw an illustration of a single Skeptical philosopher, over and over again. The first Seismoscope, for example, always draws the portrait of Portuguese philosopher Francisco Sanches, author of the seminal treatise "That Nothing is Known". The actual traces of the drawing follow a random path, although staying within the portrait image that has been burned into the memory of the device, --thus, every drawing is different. The artwork is the device itself not the drawings it makes: the collector or curator may give these drawings away, they may exhibit them as a pile on the floor or hang them neatly on the walls. Seismoscope 1: Francisco Sanches. Portuguese (1550-1623), author of "That Nothing is Known". Seismoscope 2: Abu Hamid Muhammad ibn Muhammad al-Ghazali. Persian (1058-1111), author of "The Incoherence of Philosophers". Seismoscope 3: Sextus Empiricus. Greek (160-210), author of "Against the Mathematicians". Seismoscope 4: David Hume. Scotish (1711-1776), author of "An Enquiry concerning human understanding". Seismoscope 5: Pyrrho of Elis. Greek (360-270 BC), proponent of Acatalepsy (impossibility of comprehending a thing). Seismoscope 6: Nicolas Malebranche. French (1638-1715), dedicated his work to refute Cartesians. Seismoscope 7: Juan Huarte de San Juan. Spanish (1529-1588), author of "Examen de ingenios para las ciencias". Seismoscope 8: Baruch Spinoza. Dutch (1632-1677), vehement attacker of superstition. Navier-Stokes is a series of computer-controlled light-boxes which animate satellite pictures of border regions that have heavy migratory traffic, a vector of economic disparity or a history of military conflict. Instead of using regular white fluorescent light tubes to illuminate the duratrans film, the pieces have over one hundred thousand light emitting diodes (LEDs), which can highlight tiny features within the print. The first piece shows the Mexico-USA border with Mexico illuminated red by default while the US is dark. Periodically, a random opening of the border lets a plume of red color take over the United States. Once both countries are red, the color of the United States gradually fades back to black. "Company of Colours" is the ninth piece in the Shadow Box series of interactive displays with a built-in computerized tracking system. This piece shows the live surveillance camera view constructed out of a variety of culturally significant color swatches and palettes, from the 4 shades of green of the original Nintendo Gameboy to the X11 CSS3web browser palettes. "Make Out" is the eight piece in the Shadow Box series of interactive displays with a built-in computerized tracking system and is shown in the Shadow Box format as well as a large, interactive installation. 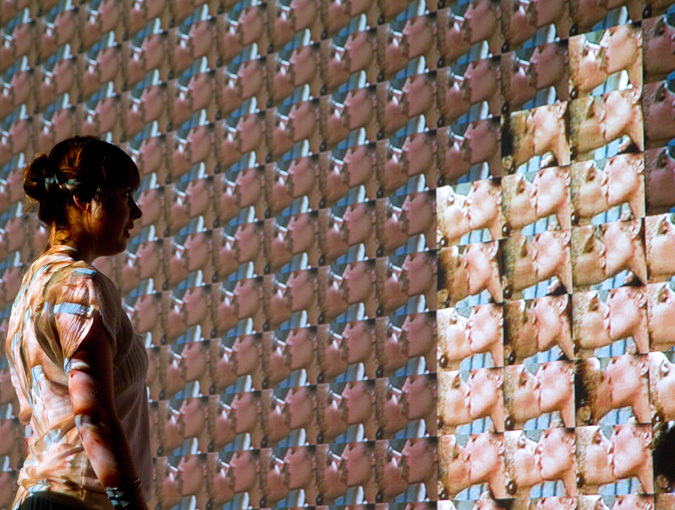 This piece shows thousands of internet videos of couples looking at each other: as soon as someone stands in front of the display his or her silhouette is shown and all the couples within it begin to kiss. The massive array of make-out sessions continues for as long as someone is in front of the work, - as he or she moves away all the kissing ends. The collector can choose what proportion of the videos are man-woman, woman-woman or man-man. The default state is the statistically faithful proportion of the videos that are online: 50 per cent woman-woman, 30 per cent man-man and 20 per cent man-woman. Installation view at Galería Max Estrella, Madrid, Spain. "Pulse Index" is an interactive installation that records participants’ fingerprints at the same time as it detects their heart rates. The piece displays data for the last 509 participants in a stepped display that creates a horizon line of skin. To participate, people introduce their finger into a custom-made sensor equipped with a 220x digital microscope and a heart rate sensor; their fingerprint immediately appears on the largest cell of the display, pulsating to their heart beat. As more people try the piece one’s own recording travels upwards until it disappears altogether —a kind of memento mori using fingerprints, the most commonly used biometric image for identification. The project exists in a small plasma version which features a 58 inch HD screen hung in portrait mode and in a large projection version which can be as large as desired. A small surveillance monitor on a stainless-steel stand rotates automatically to reveal a geolocalized poem. As the public walk around the piece it shows the cardinal directions and a text locked to them. The text is an excerpt from Vicente Huidobro's epic poem "Altazor" (1919-1931), which reads "The four cardinal directions are three: North and South". A circular display that simulates the turbulence at the surface of the Sun using mathematical equations like navier-stokes, reaction-difussion and perlin noise. The piece reacts to the presence of the public by varying the speed and type of animation displayed. If no one is in front of the piece the turbulence slows down and eventually turns off. As the built-in camera detects people more solar flares are generated and the fake Sun shows more perturbation and activity. At 140 cm diameter, "Flatsun" is exactly a billion times smaller than the real Sun. The piece consists of custom-made panels with 60,000 red and yellow LED lights, a computer with 8 processing cores, a camera with a pinhole lens (you can see the black dot in the middle of the display) and a mechanically engineered aluminium, steel and glass structure that pivots for maintenance. A single knob lets the collector set the brightness of the piece and turn it on and off. 17 x 17 x 4"
"Zero Noon" is a digital clock that shows the current time according to eccentric metrics: it uses hundreds of different reference systems. For example, the clock can tell the time based on the average number of daily financial transactions in Brazil, the average daily amount of cookies sold by girl scouts, the number of animal species that become extinct per day, the daily average number of breaths that a typical human takes, and so on. Basically, "Zero Noon" is a clock that is run by internet-refreshed statistics. The clock's statistics are all synchronized so that precisely at noon they all zero and start over. At noon automatically a new metric is displayed in a different colour chosen from a determined palette. The public may also change the statistics by manually scrolling through the list using small push-buttons under the built-in display. This guarantees that the content of the clocks is always fresh and thought-provoking. The statistics come from government data, Harper’s Magazine, financial institutions, NGOs, academic studies and other trusted sources. Some of the data streams will be useful, others sobering, some of them fun. The actual metrics are chosen by the artist studio but the collector is also able to add statistics to the system. A clock shows a large number, readable from far away: as you get closer you can read on the bottom the “fine-print” which is the actual reference baseline for that clock, e.g. the average daily number of births in the world. Each statistic is also cross-referenced with the source of the data. The clock generates a faint “ticking” sound every time that the handle passes noon. For some statistics this ticking will be very sporadic whereas for others it will be very frequent. The volume will be set so low that only someone within 3 feet of a clock will be able to hear it. “Airborne” was an interactive installation by Rafael Lozano-Hemmer designed to transform a 900 square metre wall in Norfolk’s public space into a poetic shadow play. Participants blocked the light of two powerful projectors casting their shadows on the wall, and these were tracked by computerized surveillance systems. Out of the shadows emanated bellowing smoke which was mapped onto the wall and accumulated in it. Readable within the smoke were clouds of text, themselves turbulent, from salient poetic texts on light and shadow by Dylan Thomas, John Ashbery, Nicole Brossard, William Blake, Wallace Stevens, Adrian Matejka, Kathy Acker and other poets. In the installation each poem could be heard declaimed, often by the actual poet, while its text was converted into smoke by passers-by. Mexican-Canadian artist Rafael Lozano-Hemmer presents his recent interactive installations that are at the intersection of architecture and performance art.